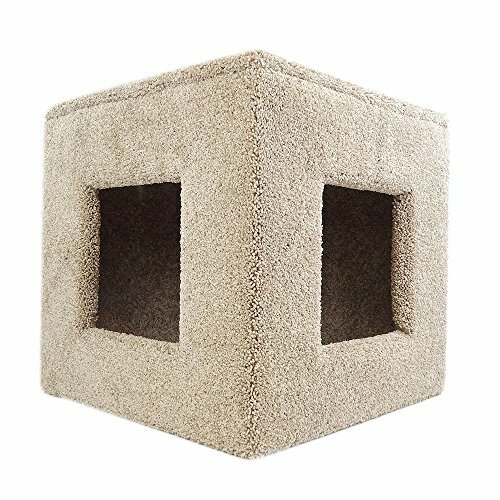 Home » Cat Trees Carpet Covered Works Of Art? 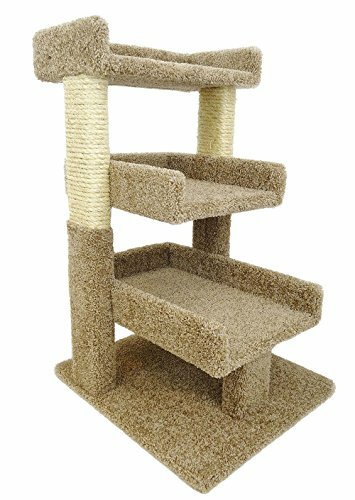 Cat trees carpet, plush or plain wood? 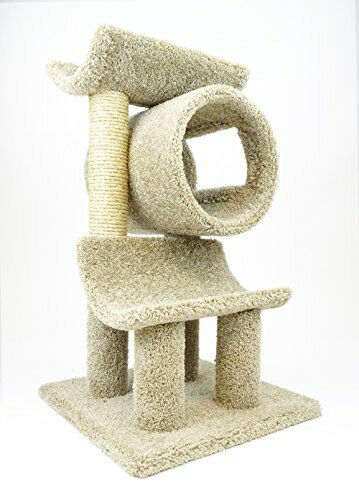 Seriously, cat trees are carpet covered works of art if done right. 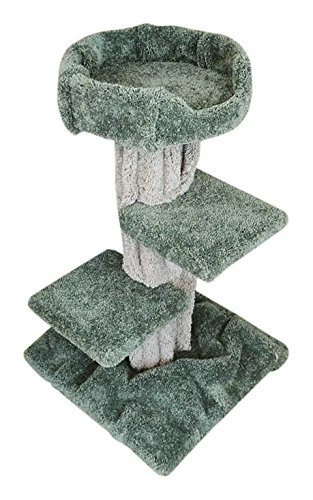 And the carpet covered cat towers usually are the most well-made and the sturdiest of all the cat furniture out there. 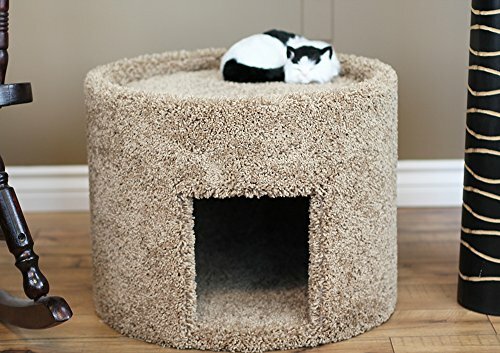 Let’s face it we use carpet for these because it’s very durable, comes in a bazillion different colors and textures and is still a fabric so it can be wrapped around stuff like posts, platforms and tubes. Are you in a hurry? No Worries! 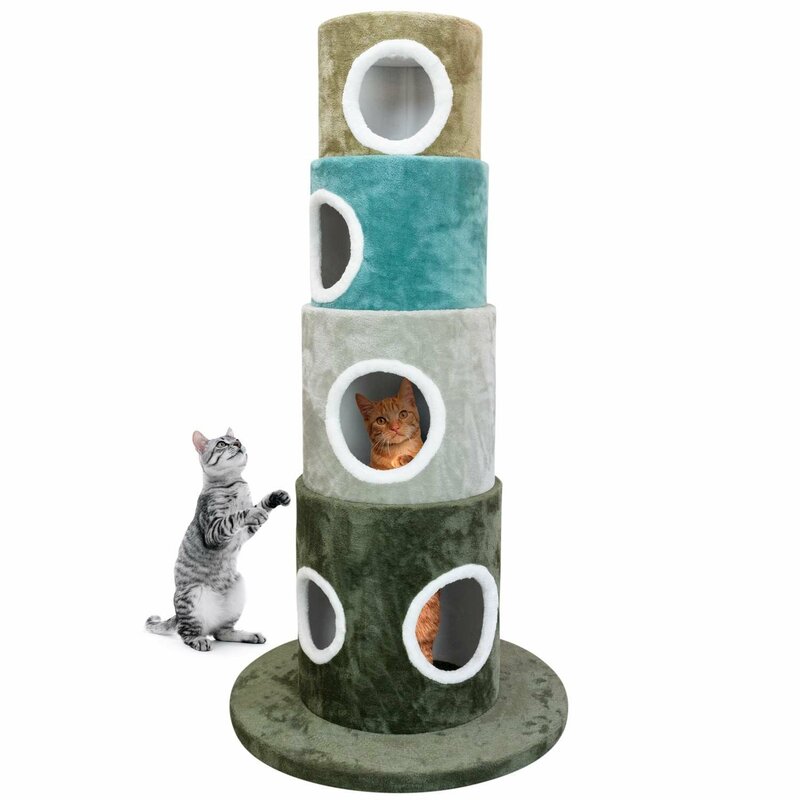 Cat Trees Carpet Covered… Pagodas? 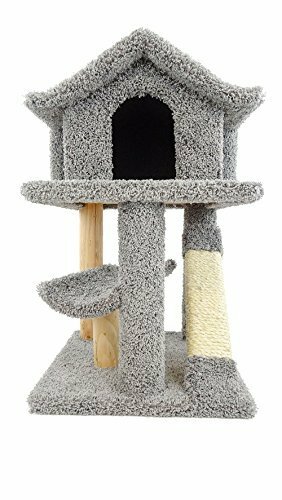 Cat Trees Carpet Covered… Clock Towers? 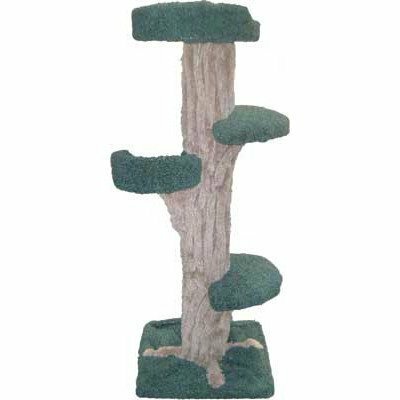 More Cat Trees Carpeted Works Of Art! 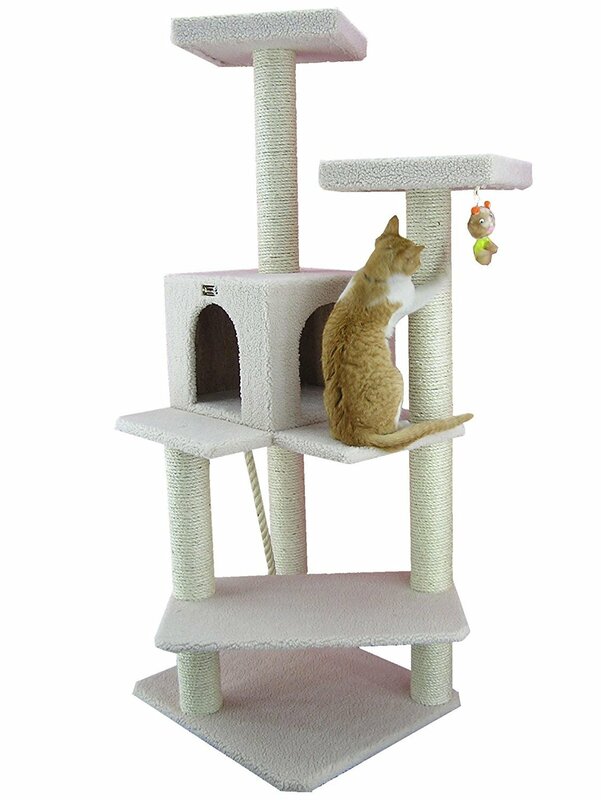 We love the fancy “Pagoda” top on this carpet covered cat tree. 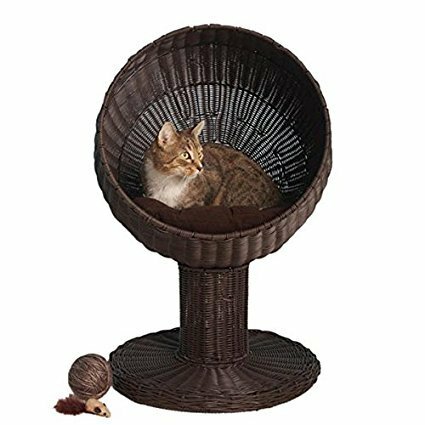 It really has all the bells and whistles featuring sisal scratching posts, multiple cat beds and a covered hiddy-hole for your kitties to enjoy. 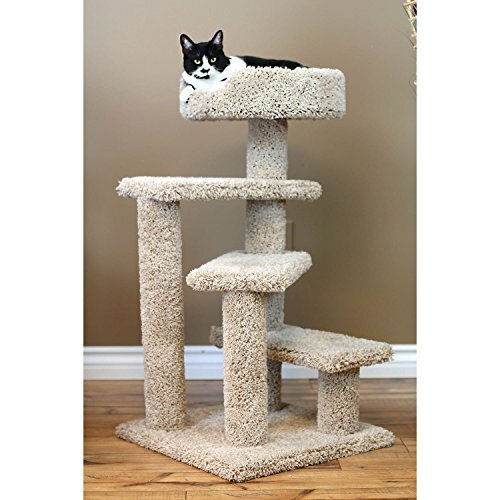 It’s made out of solid wood and covered in premium household grade carpet. It should also be mentioned that the sisal is not oiled so you won’t have any worries on that score. Your cats can scratch to their hearts content in safety. And it’s made right here in the USA. 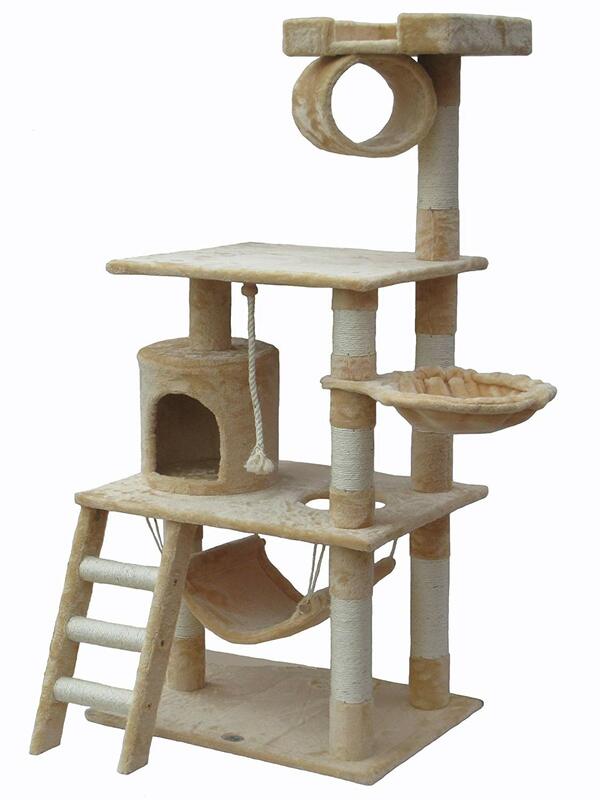 How cool is this cat condo? It’s made to look like a grandfather clock! Have to saw when we saw this we went kinda nuts. 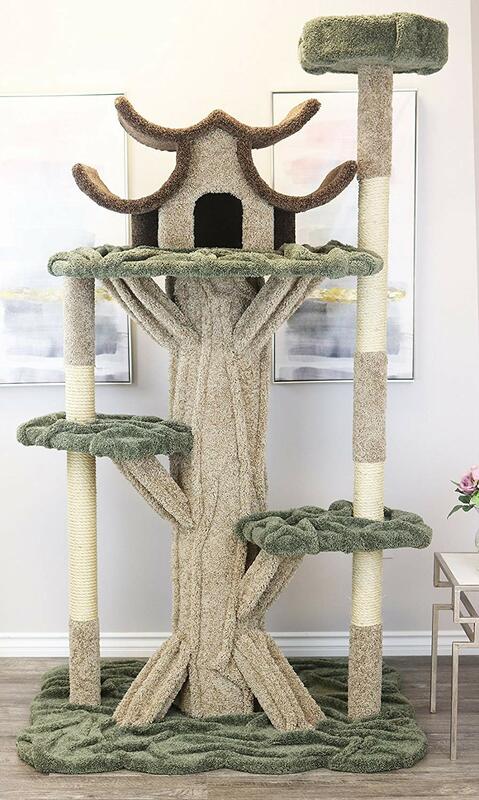 We’ve never seen a cat tree like this one before. And this beauty is built to last, too. 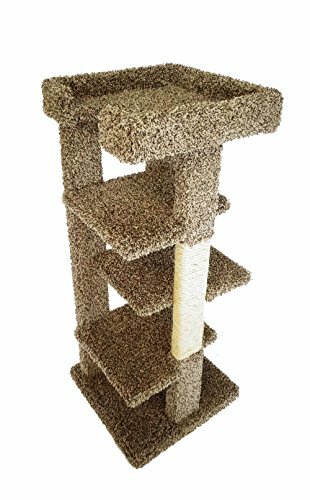 Just click right here (or the image above) to see close up details of the solid wood, unoiled sisal rope and premium household carpet “New Cat Condos” uses to build these sturdy cat trees. 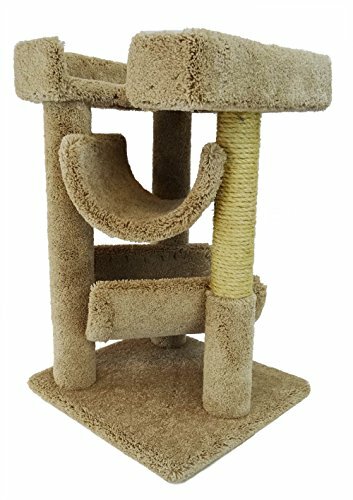 This model comes in completely assembled in your choice of beige, blue, brown, green or grey. And because it’s an Amazon Prime product there’s NO SHIPPING FEE! How great is that? 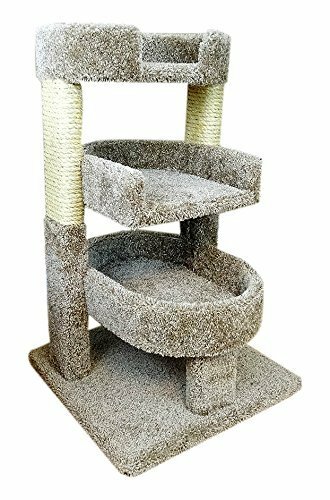 Something we really like about the folks at “New Cat Condos” is they don’t skimp on materials and their cat furniture is made to last! 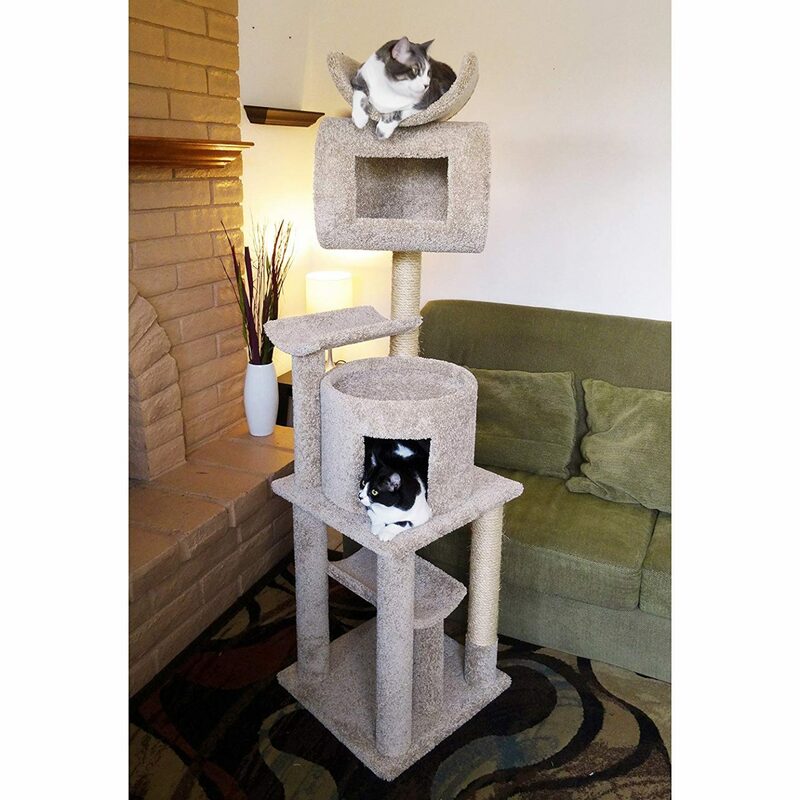 All their cat trees are made from SOLID WOOD and they are fitted together with metal connectors. BONUS: Assembly is a breeze. 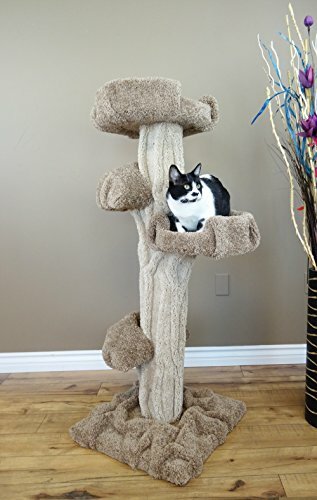 The cat tree pictured here arrives in four pieces. The base and two lower cat beds is fully assembled. 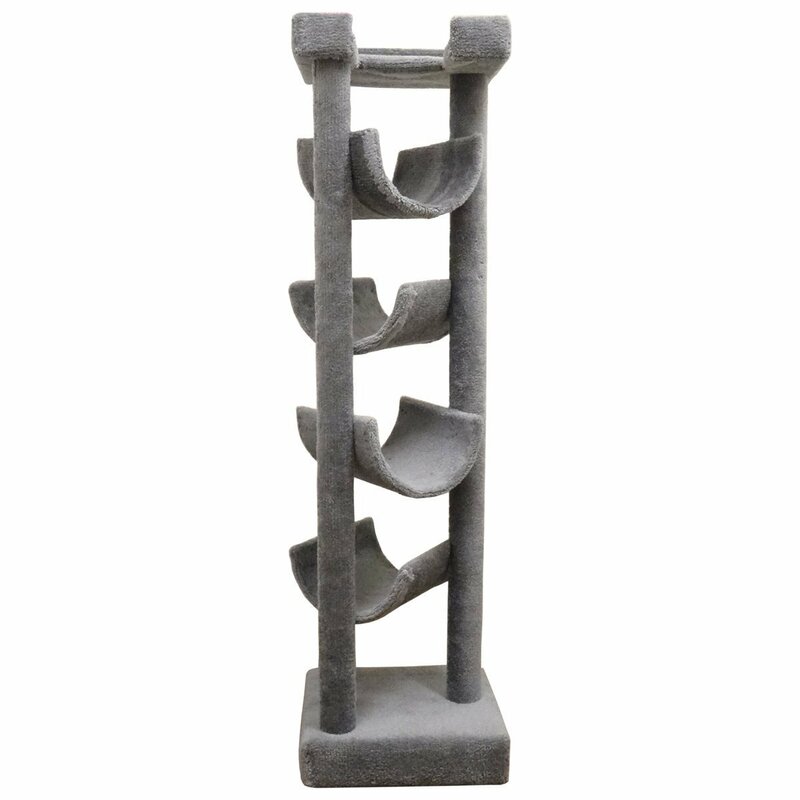 All you have to do is screw on a pole and the two upper beds. 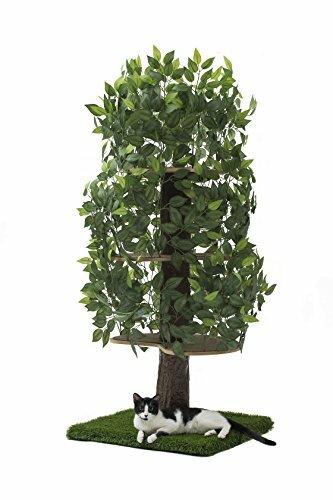 This delightful cat tree actually looks like a real tree! It’s made right here in the USA from solid wood, household grade carpet and unoiled sisal rope. 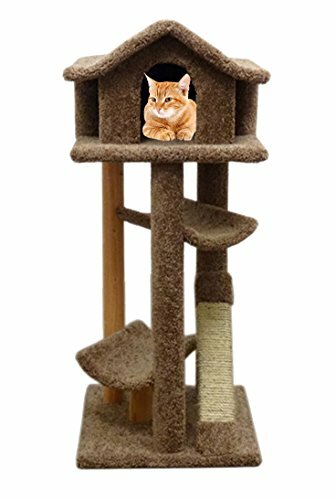 This cat tower has some one of the highest review ratings we’ve ever seen. 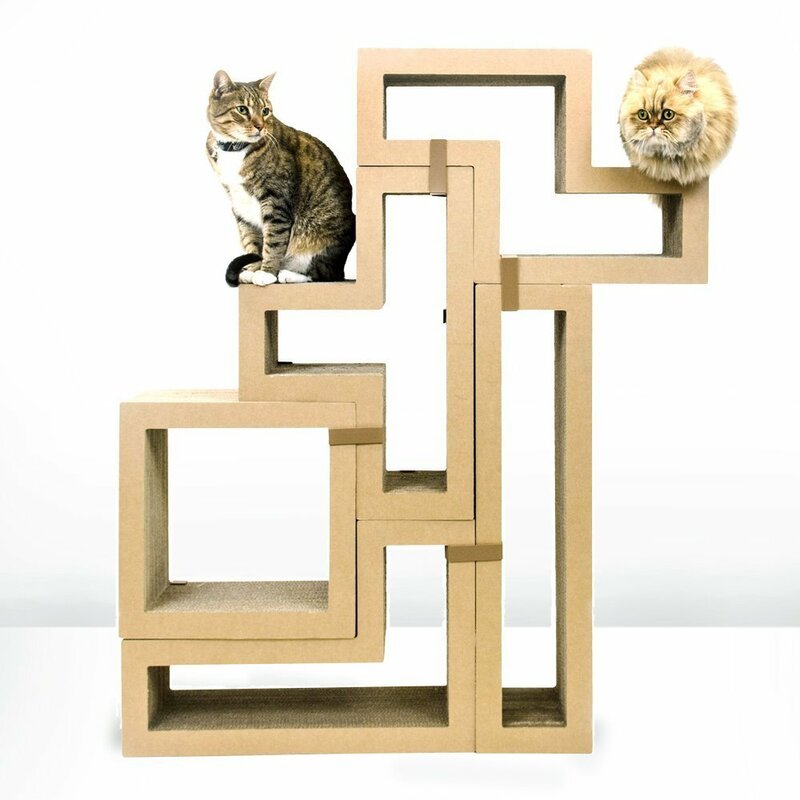 NOTE: Some small assembly is required but we are assured it takes a mere 3-4 minutes to attach the top perch. That’s it! 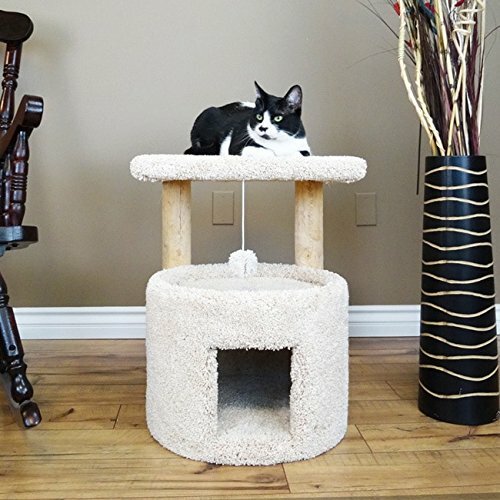 This beautiful bit of cat furniture is rock solid so it can handle really LARGE CATS jumping on it without tipping over. And best of all, shipping is FREE. 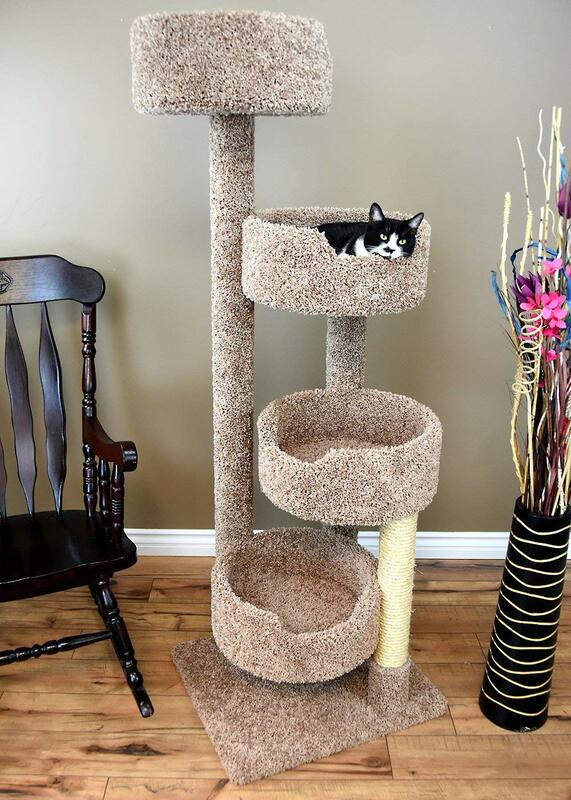 This “cat tree” is insanely versatile. We love how modular it is. 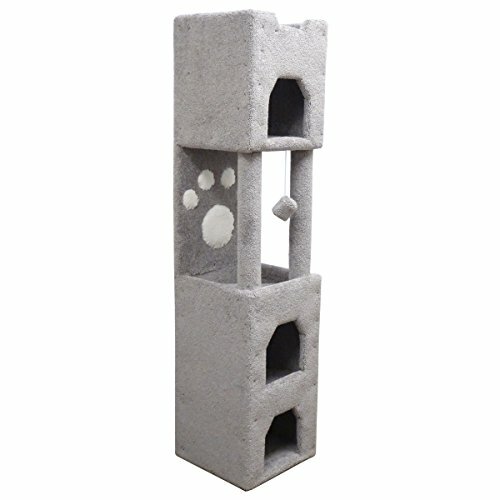 When assembled in one tall tower (as shown here) it’s over 4 and a half feet tall. 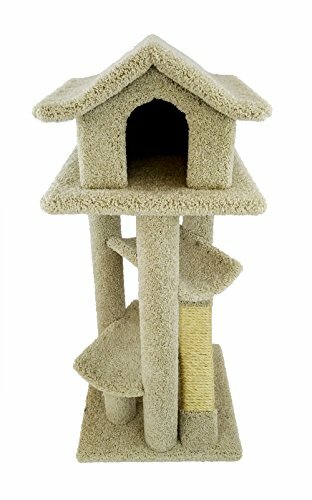 The inside is open all the way to the top so your kitty can climb up the outside or inside to show off her “catrobatics”! 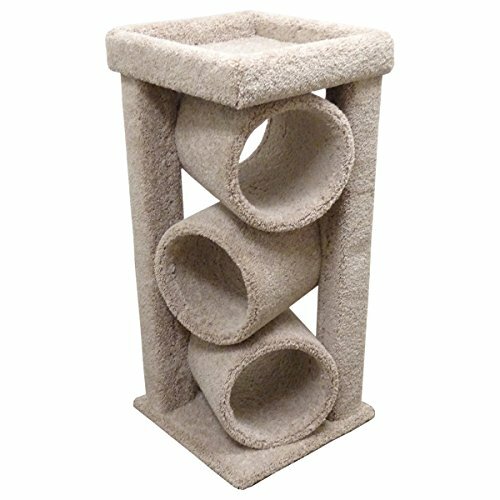 The pieces are held in place (if you choose to stack them as shown) with super strong velcro so they are easy to put together but are very stable for your kitty. All the pieces nest inside one another which makes it super easy to move and really space saving if you need to tuck it away for a while. 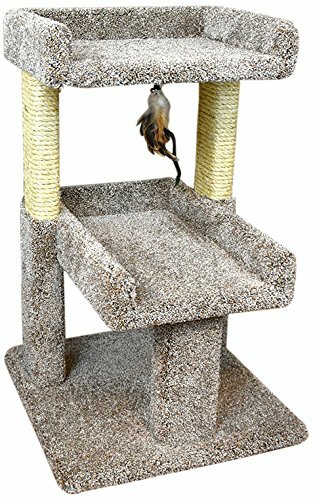 This beautiful carped covered cat tree comes with 4 carpet and 2 sisal covered posts for your cats to scratch to their hearts content. It’s very tall clocking in at a whopping 71 inches! 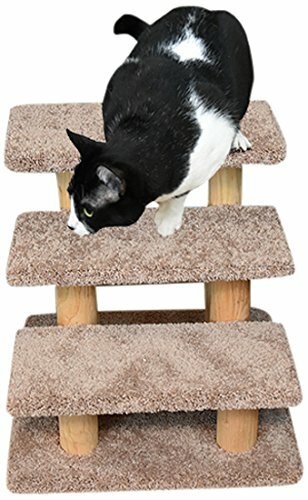 This gives your kitties lots of climbing room because you know how they love to be “up high”. 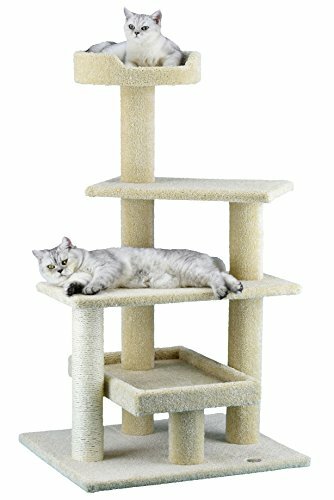 Even though it’s tall, this cat tree is stable enough for multiple cats to use at once. 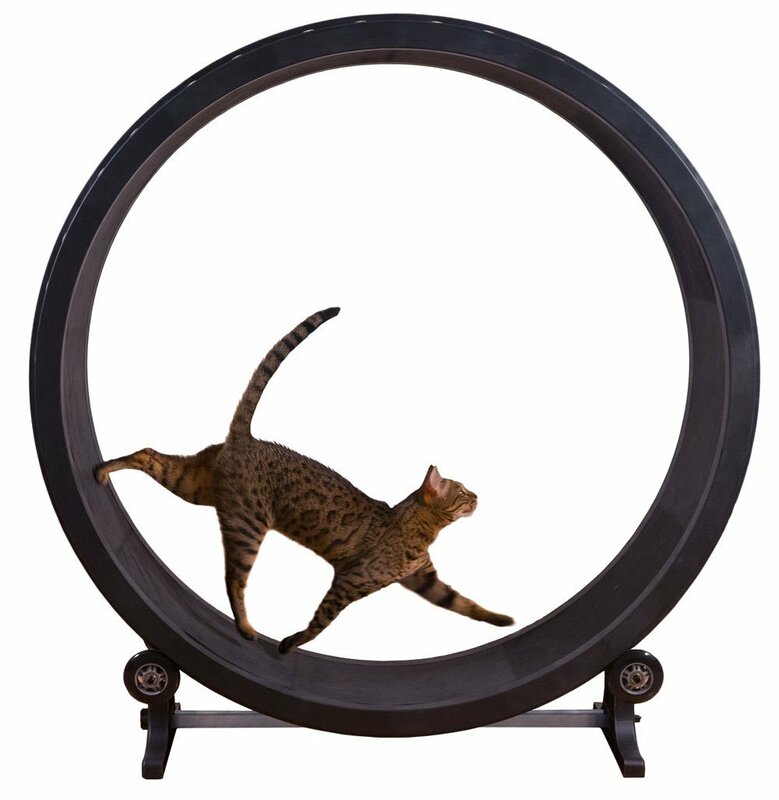 Just check out Tabby and Mr. Whiskers hangin in out on their awesometastic new play gym! Though this is pretty enough to be out in the middle of the room we don’t actually recommend it. 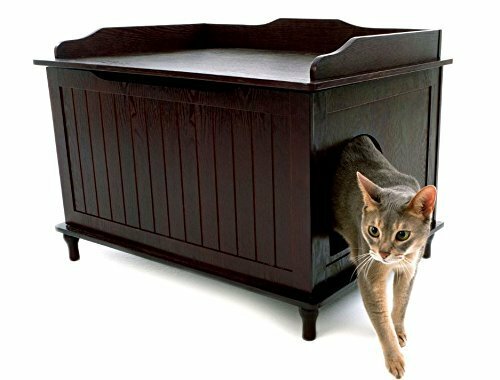 Putting it up against a wall or in a corner will give you more piece of mind and you’re cats will most likely like it better that way too. Hand made in the USA using no toxic chemicals or glues. 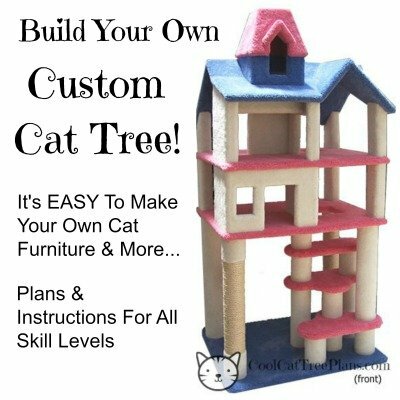 It does require some easy assembly but comes with both written instructions and an instruction DVD to make it a breeze to put together even for frazzled Dad’s on Christmas Eve! 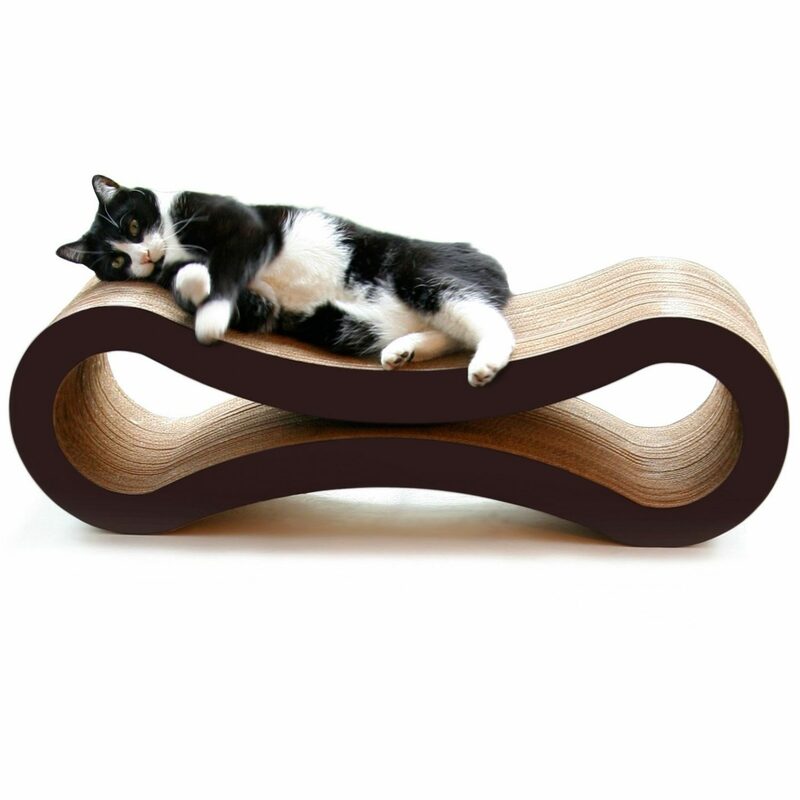 We’re sure you’ll agree that there’s nothing ordinary, boring or plain about this cat furniture. 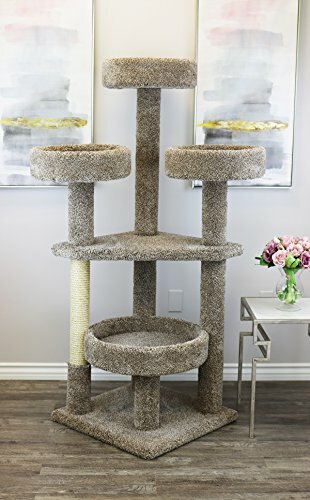 In fact these cat trees, carpet covered works of art, are so unique and sturdy they will grace your home for years to come. 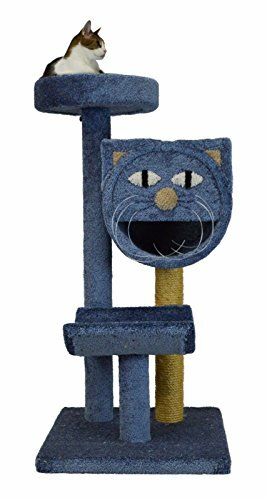 They’ll keep your cats happily entertained and serve as an excellent conversation starter for all the visitors to your home. 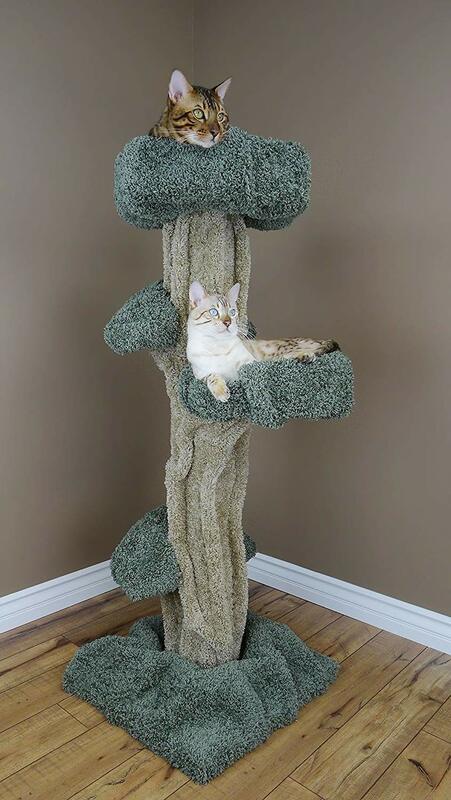 Be sure to Follow Us On Pinterest so you never miss a Cool Cat Tree! 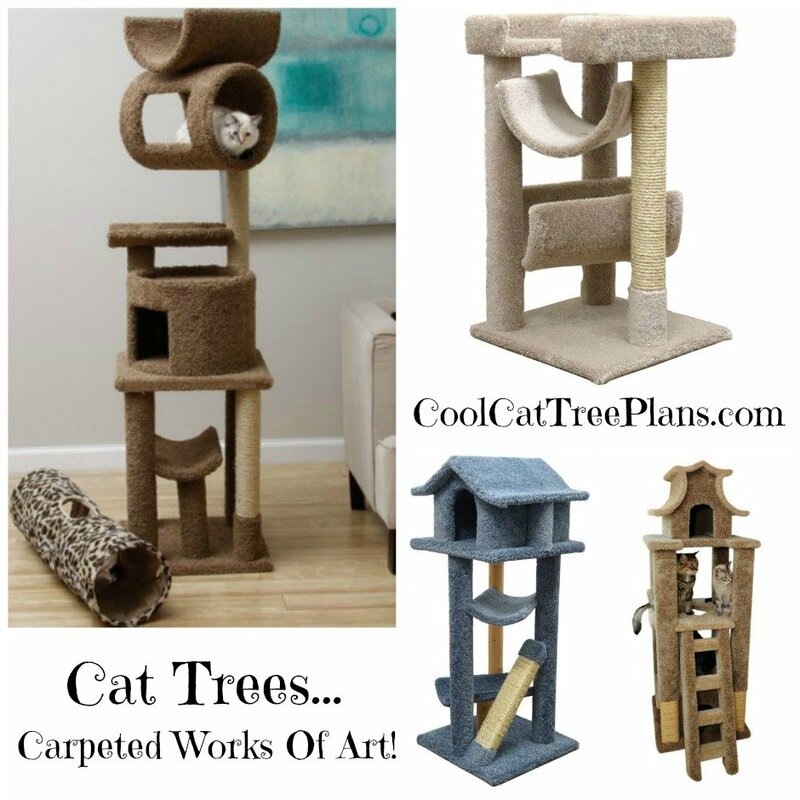 Like “Cat Trees Carpeted Works Of Art”?